The hotel façade is in old Indochina style, facing the Khun Bu Lom street. 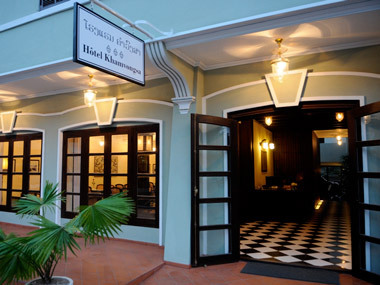 Welcome to our cozy and elegant family run hotel in the old part of central Vientiane. We offer bright, spacious rooms, individually decorated in French colonial and Lao style, with all modern conveniences for long and short-term stays. Meters from the beautiful Mekong river, Hôtel Khamvongsa (simply pronounced KAAM-VONG-SA) is a short walk from Vientiane landmarks such as the Nam Phou Fountain in a quiet location opposite the tranquil Inpeng temple. Our team of friendly, dedicated, English speaking staff takes pride in providing top quality service, caring for the different needs of our guests. Whether you are in Vientiane for business or pleasure, travelling solo or with the family, Khamvongsa offers all you need and more at good value: stylish rooms with comfortable beds, free internet access, and a delicious and generous breakfast. Come and discover the charms of Vientiane and find out why our guests often stay longer than expected. For enquiries and bookings, please contact us, by filling out the inquiry form.